DO YOUR EFFORTS TO PACK ON LEAN, QUALITY MUSCLE MASS KEEP CRASHING? TRY THIS LIST OF 22 TROUBLESHOOTING TIPS TO REBOOT YOUR PROGRAMME. ■ Computers are awesome…until they’re not. The power we have at our fingertips to cut video, create apps, watch cat videos, and write articles for fLEx is immense. Yet one line of mangled code can turn our state-of-the-art laptop into a frustrating, broken husk of metal and wires in a split second. Like our electronics, our bodies can stop behaving as expected, too. Say you’re on a massgain plan and it’s going well. No bugs, no spinning pinwheels, just forward progress as you pack on the lean kilos. Thing is, much like a computer, it could simply be a problem of inputs. A lack of progress could be a sign your body has adapted to your workouts, or you’ve introduced a rogue element that has thrown the programming out of whack. Here, we provide 12 tips to troubleshoot your training regimen, along with 10 more for nutritional issues. While none are a magic bullet on their own, a few could be just the thing to reboot your system and recharge your gains—no call to the Geek Squad or reservation at the Genius Bar required. He’s Back ! 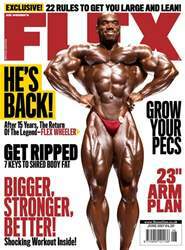 After 15 Years, The Return of the Legend FLEX WHEELER 2) 23” Arm Plan 3) Get Ripped: 7 Keys to Shred Body Fat 6 EDITOR’S LETTER 7 ONLINE 8 IT’S ONLY MY OPINION 12 JUST THE FACTS 16 Flex Wheeler Cover Story 28 Davey Henderson 36 CLASSIC MUSCLE 42 LOOKING BACK 52 1ST SET 64 LIFT 78 FOOD & SUPPS 84 Chicken 3 Ways 92 7 Keys to Shredding 102 Crack Your Mass 112 High-Volume Workout 120 Pec Power Play 128 LAST SET 144 THE SHOT.